Rated 1 out of 5 by rydalgal from Very bored Panda! Beyond boring .... sorry! Repetitive! I'm not even sure it would amuse a child to be honest. Much better games out there! 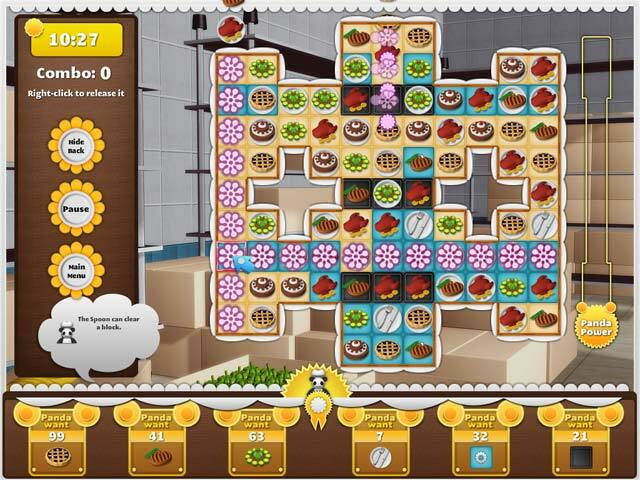 Rated 1 out of 5 by Katefish12 from Definitely not I like Match3 games for a change - but they need to be a bit challenging, or have an interesting storyline. This isn't - graphically dull, no story, dead easy. I lasted ten minutes then deleted it. Rated 1 out of 5 by TucsonWoman67 from Broing Considering today's technology and what match games can do these days, this game is from the dark ages. I wonder why it is even put on the site for sale. Even for a rank beginner at match 3 this game would be boring. Graphics: low quality. Speed: slow. Same thing over and over. Rated 1 out of 5 by espy25 from Could Be Worst Ever! I saw some others' reviews but thought I'd give it a try anyway, since I so want to play a game that isn't a HO. It took me longer to install & uninstall it than the time I took to play it. This isn't even worthy of being a free game! As others have stated so well, this is hard to see, s-l-o-w and has little to no enjoyment #even for a child#. Rated 1 out of 5 by catsbeer2 from And this serves WHAT purpose? OMGosh! This serves NO purpose whatsoever! For autistic kids, this is just NOTHING! I found NO story line; and the music is just crazy! good beat jive then adolescent pish-posh! Not even close to fun; a bad headache gone ballistic! This is a do-over if I ever saw one! and this was only after 2 minutes! 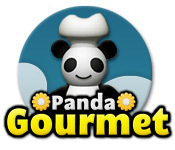 Rated 1 out of 5 by giraffe227 from Boring M3 Game Panda Gourmet has got to be one of the most boring M3 games I have ever played. I go back and forth between Hidden Object and Time Management. When there is nothing happening in these genres, I try M3. What a big mistake! Panda Gourmet was like playing in slow motion. No excitement, dull kiddie sounds and no challenge whatsoever. Even though I do not play M3 games very often, the games I have played were pretty challenging, with great sounds and music. Rated 1 out of 5 by bidartia1034 from At best lame I painstakingly played the demo for 7 minutes I ended the game at the beginning of the eighth. Really BF how can you put such games. Rated 1 out of 5 by surfgrrll from surfgrrll I lasted 4 minutes. I am all about relaxing but this was not great. Rated 1 out of 5 by cozzyozzy from mad panda Awful!! but better then the hidden object games. Not worth the time to download though, just another 3 match game with cheap graphics. Rated 1 out of 5 by parkersam from kung poo panda Good game if you want to be bored beyond belief, otherwise go head and buy it as a cure for insomnia. Rated 1 out of 5 by donadriedger from WOW..THAT'S BAD!! This is the worst game I have ever seen! If you are going to create an M3 game, you have to make it move quickly..nobody wants to play a slow and cumbersome one. 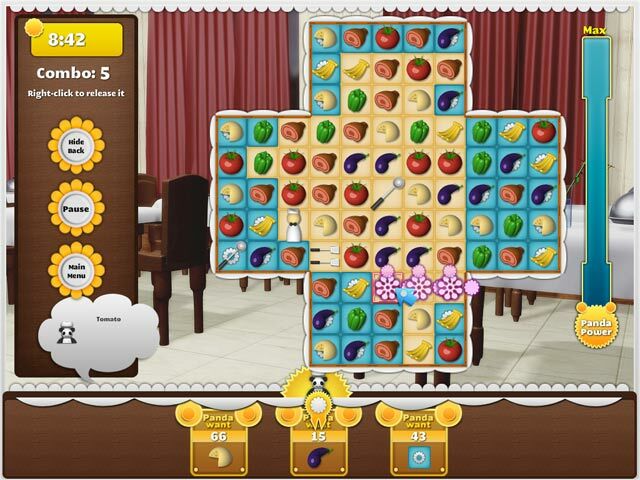 It seems you are trying to collect more of one type of food than the other, as indicated by a square on the bottom of the screen. Otherwise there is no change to the board, no coloured squares, no locked in items and no point to the game at all! I couldn't stand to play longer than about 10 minutes, so I am not sure if it improves at a later stage, although I seriously doubt it. I can't for the life of me understand why BF would even consider releasing this one! Rated 1 out of 5 by rainice from Are you kidding? I don't think I lasted more than two minutes on this fiasco. The playing board is minute with tiny squares you can hardly see. 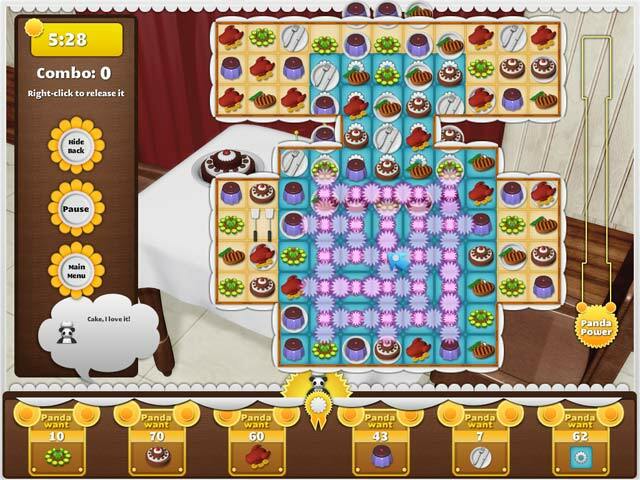 The game is set in a windowed mode that you can switch to full screen, but all that does is give more background, the playing area remains the same. There is only one mode of play. Timed. I don't play timed. This is really bad. I can't imagine why Bigfish thought it was a good choice. Rated 1 out of 5 by sparty71 from You've got to be kidding me! Do you really think that this game is worth either a game credit or $6.99. I love M3 games...and this is terrible. No fun...no challenge. This is a waste of my time and talent :( There have to be better M3 games that can be offered!! Rated 1 out of 5 by Sugarm40 from Don't waste your time! Have to agree with Lotusdk. Read the review but thought I'd try the game anyhow, so wish I hadn't, its dreadful. No story and just monotonous. There is nothing to strive for. Rated 1 out of 5 by dueler from are you sure? well this must be one of the most boring/awful games i've seen on BF, seen it, done it, and wore the T-shirt about the time the spectrum come out. A free to play game, maybe, but to pay good money for it, you must be joking, wouldnt waste a GC or a PCC on it. Shame i had to give it astar even. Rated 1 out of 5 by boekstart from for little children its boaring, the noices are terrible, played for 10 min.